This substantial 3,990 Sq ft Grade II Listed Tudor Farmhouse occupies an idyllic rural location on the periphery of the town and opposite the popular Nowton Country Park. The main house itself is steeped in history and boasts many characterful features throughout including a wet cellar, exposed timbers and open fireplaces. The open plan sitting and dining room located centrally within the house is a superb social feature with a separate drawing room at the opposite end of the house enjoying views over the rear gardens. 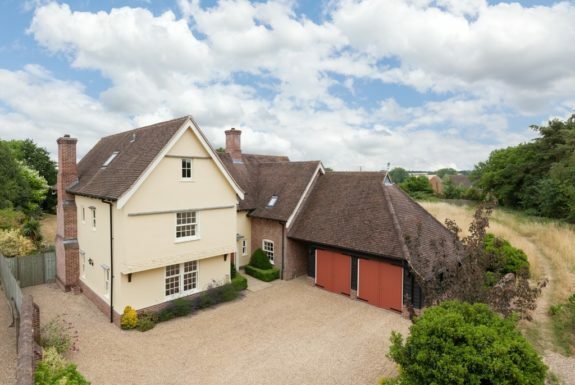 Further benefits to the property include secondary accommodation in The Coach House and superb equestrian facilities of which include stables, feed and tack stores and post and rail paddocks. There is also a separate workshop and further useful outbuildings surround a large hardstanding yard. In all about 3.6 acres. DRAWING ROOM This light and spacious sitting room enjoys triple aspect views over the surrounding gardens and doors opening to an outside dining area, enjoying a southerly aspect. The room itself features exposed wooden floors and an open fireplace with decorative wooden surround and slate tiled hearth. OFFICE/SNUG A useful room with double aspect views over the rear of the property and featuring tiled flooring and a decorative fireplace with wooden surround. FARMHOUSE KITCHEN Located in an extension to the original building this farmhouse style kitchen is extensively fitted with a range of Oak wall and base units beneath worktops with a Belfast sink inset with an oak drainer, integrated electric double oven with four ring hob and extractor over. Space and plumbing if provided for a dishwasher, washing machine and upright fridge freezer. There is also a central preparation island and two hob AGA inset a fireplace. A separate boiler room and pantry provide further storage and utility space. BOOT ROOM Located just off the kitchen this useful room features brick tiled flooring and offers plenty of space for coats and boots and features a door opening to the rear of the property and stables beyond. CELLAR The original wet cellar to the building features plenty of ground level and above floor storage set within brick built alcoves. REAR HALLWAY With slate tiled flooring, door leading to the rear gardens and an under stairs storage cupboard. CLOAKROOM Comprising WC and wash basin. LANDING The first floor landing enjoys views over the rear aspect and features many exposed ceiling timbers and stairs rising to the second floor. MASTER BEDROOM The generous master bedroom enjoys double aspect views over the front and south facing rear garden and features exposed floorboards, ceiling timbers and a large built-in double wardrobe. The Jack and Jill EN-SUITE features slate tiled flooring and is fitted with a white suite comprising WC, wash basin and panelled bath enjoying views over the front aspect. BEDROOM 2 With a personal staircase rising from the first floor and separate access to the landing this spacious room enjoys views over the rear aspect and features exposed floorboards and a decorative cast iron fireplace. Stairs rise to a second floor Bedroom (6) that offers use as a separate Games Room or Dressing Room). BEDROOM 3 A double room with views over the front aspect, built-in double wardrobe and access to the Jack and Jill EN-SUITE. BEDROOM 4 A further double bedroom with exposed wooden floors and views over the front aspect. SHOWER ROOM Fitted with a glazed and tiled shower cubicle. BEDROOM 5 A large attic bedroom enjoying stunning elevated views across the rear gardens and paddocks beyond. BEDROOM 7 Currently utilised as a storage room with views over the rear aspect. 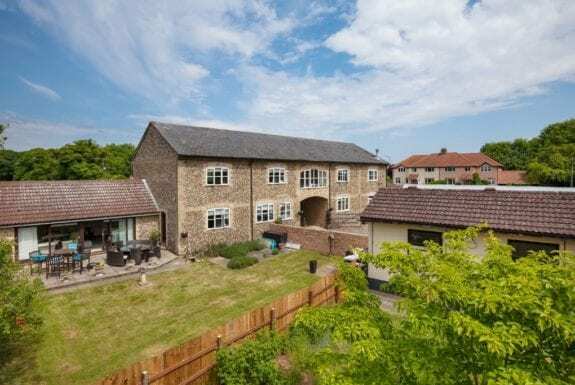 Outside The Farmhouse is approached via a five bar double gate opening to a sweeping gravelled driveway providing plenty of off road parking. There are high tree lined borders and an expanse of lawn wraps around to the rear gardens that feature a larger expanse of lawn interspersed with many mature trees and featuring two outside dining terraces enjoying southerly views towards the paddocks. Two separate five bar gate entrances open to a large hardstanding yard offering a great deal of parking and storage for horse boxes and trailers and features a DOUBLE CART LODGE, 3 BOX STABLES, TACK ROOM and FEED STORE. A separate building features a further useful storage room and WC. An area of meadow leads to a further useful outbuilding including a separate workshop with power and light connected. This area of meadow grants access to the post and rail paddocks measuring approximately 2.25 acres. OPEN PLAN LIVING AREA This large open plan living space features a slate tiled floor and is separated into various areas offering ideal space for seating and dining. A log burning stove (with exposed flue) sits centrally within the room. There are double aspect views over the stables and private gardens. KITCHEN Extensively fitted with a range of modern wall and base units beneath worktops with a stainless steel sink inset, space and plumbing for fridge freezer, washing machine, dishwasher and electric oven. There are views and door leading to the Farmhouse's main driveway. BATHROOM Featuring tiled walls and floor and fitted with a white suite comprising WC, glazed wash basin, panelled bath and separate double shower cubicle. BEDROOM 1 A generous sized bedroom steeped in character with exposed brick and flint walls and floorboards. BEDROOM 2 A further bedroom featuring exposed brick and flint walls and floorboards and enjoying views over the internal courtyard and stables. Outside The Coach House benefits from its own generous sized private rear garden enclosed via a high hedgerow boundary. In all about 3.6 acres.